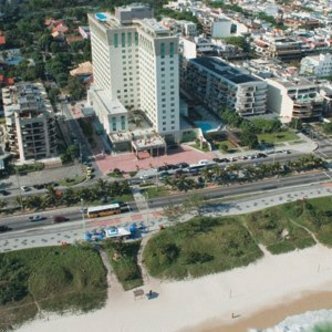 The Windsor Barra Hotel is ideally located facing Barra Beach. The most modern part of Rio de Janeiro, Barra has all to offer. From Shopping malls - largest offer in Rio - to theme parks and bars, disco, night life, theaters, cinemas, and many more. The hotel has a fantastic rooftop terrace with pool, fitness, sauna, bar andbreathtaking 360 degree view. NEW YEARS PACKAGE CONDITIONS - From the period between 28 DEC08 to 01JAN09. New Years Package- In this period the hotel requires a minimum stay of 4 nights - only for December 28 to December 31. All cancellations must be made 60 days before check-in date to avoid any penalty. In case of cancellation after due date, no show, date change or early check out the hotel will charge for the entire package period 4 nights New Years Package. This charge is NON REFUNDABLE. It is Important to inform contact telephone number, email address in case that the hotel needs to contact the Travel agency or customer. NEW YEARS PACKAGE includes 04 nights all with buffet breakfast. It is necessary to inform also, the security code or send Paytell /pre-payment/ through Utell to guarantee your reservation. CARNIVAL PACKAGE CONDITIONS - From the period between 20FEB09 to 25FEB09. Carnival Package- In this period the hotel requires a minimum stay of 5 nights - only for FEBRUARY 20. All cancellations must be 60 days before check-in date to avoid any penalty. In case of cancellation after due date, no show, date change or early check out the hotel will charge for the entire package period 5 nights Carnival Package. This charge is NON REFUNDABLE. It is Important to inform contact telephone number, email address in case that the hotel needs to contact the Travel agency or customer. CARNIVAL PACKAGE includes 05 nights all with buffet breakfast. It is necessary to inform also, the security code or paytell to guarantee your reservation.